I have little to no knowledge of the ‘80s G.I. Joe cartoon, both because I was slightly too young for its heyday and because I spent most of my childhood watching this. (Open challenge to Community: If you make a Gospel Bill episode, I will give you $5 and an A.) So I was a bit apprehensive about “G.I. Jeff,” which was being sold almost entirely on its connection to the earlier cartoon. I shouldn’t have worried, though, because “G.I. Jeff” was an enjoyable spiritual sequel to a season two episode (as most of this season’s episodes have been), in this case “Abed’s Uncontrollable Christmas.” Also to my surprise, this episode comes closer to matching that earlier one than many of this season’s spiritual sequels have. I ended up enjoying it quite a bit, even without being completely immersed in the world the show took place in to the degree that it might have really struck me as hilarious. All of which is a long-winded way of saying that I liked this episode, but I also don’t have a lot to say about it. I liked that it turned into a weird, Inception-inspired attempt to break out of Jeff’s subconscious for a while there. I liked that it was ultimately all about death, as you knew I would. I found a lot of the individual jokes funny, but I also found the way that the episode’s whole conceit kept getting more and more ridiculous as Jeff struggled to wrangle everything together into a coherent narrative funny. (In particular, I liked how the toy commercials kept getting more and more ridiculous, starting in a place where they felt like something you might have legitimately seen on a Saturday morning and concluding in a place where Toy Jeff hits his inner child in the face.) It all added up to an episode that was more than just the sum of its parts—and the parts were already a lot of fun to begin with. One thing I liked was that the episode established its stakes fairly early on. Throughout the first act, we get hints that this was taking place in Jeff’s head, just as “Christmas” had taken place in Abed’s head. The fact that the whole crisis is tipped off by Jeff killing one of the bad guys (which, as he points out, just makes sense) gives us a further indication of what territory the episode is playing in. Then, we start to get the sound of some of the other characters earnestly imploring Jeff to come to, which suggested something more like a medical emergency than a break from reality. And in act two, rather than act three, we find out that Jeff had taken a bunch of pills with some Scotch because he was depressed about it being his birthday (his 40th, as it turns out), so his life might legitimately hang in the balance. 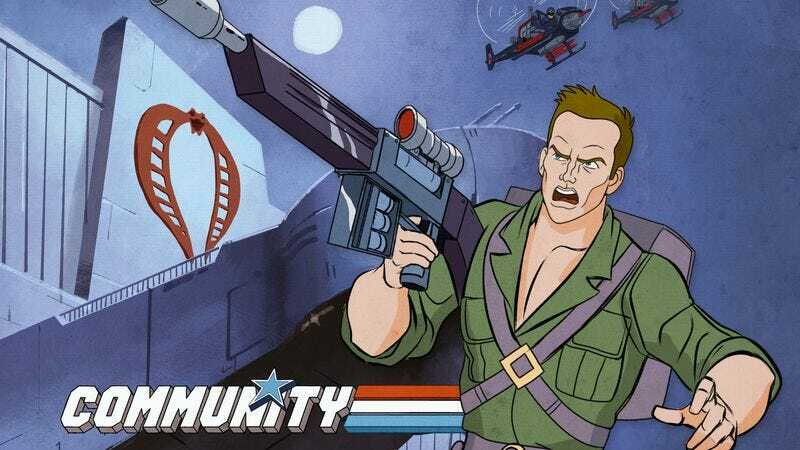 Now, it was obvious that Community wasn’t going to kill off Jeff Winger or leave him stranded in a G.I. Joe-inspired faux-topia, but these sorts of concept episodes are often able to handle some darker topics, and this was a great example of that. The episode makes an effort to point out that Jeff wasn’t actively trying to commit suicide. He thinks the pills will bring him revivified youth or something similar. But the episode also doesn’t shy away from how that act of self-destruction might as well be subconscious suicide anyway. Jeff’s horribly depressed about being 40 and having only made it as far as a community college instructor. Even if he’s surrounded with friends, he’s not in the place he thought he would be when he was a little boy and imagined greater things for himself. Adulthood might carry with it pleasures that childhood doesn’t—from naked breasts and Scotch all the way up to deeper emotional connections with other human beings—but childhood carries with it the pleasure of not really knowing how much sorrow and despair the world can hold. That’s why nostalgia for the things we loved as children is such a powerful opiate: It takes us back to a place where we knew we were loved, as Don Draper would have it. I’m not saying this episode doubles as a subtle critique of all of those Buzzfeed articles about how great it was to be a kid in the ‘90s, but I’m not not saying that either. We all get older and have to put away childish things. Getting lost in them can be a danger in and of itself. Episode director Rob Schrab beautifully captures the animation limitations of ‘80s afternoon cartoons. That sounds like a back-handed compliment, but it’s not. There’s not a lot of room for expressiveness within the stock poses and postures of the G.I. Joe characters, so Schrab mostly has to rely on Dino Stamatopoulos’ script to carry the episode’s emotional weight. But he finds room both for gags about the cheapness of this sort of animation and for some nicely eerie visuals, like that weirdly abandoned Greendale campus that Wingman and the rest of his crew wander through when he’s trying to determine his origins. He also has a lot of fun with some of the script’s throwaway gags, like that cell full of G.I. Joe rejects (Shark Arms!) and the fact that Britta has a buzzsaw for an arm (and seems inordinately proud of it, as you know she would). Schrab also captures nicely the flat lighting of ‘80s toy commercials, which sounds like another slam but is seriously a compliment. If I have a complaint about the episode, it’s probably that final scene in the hospital, which I think works a little too hard to put a cap on everything that doesn’t leave the audience contemplating their own mortality. (I am only half joking here.) Yes, one of the things that’s best to tell yourself at 30 or 40 or 50 is that you’re not that old yet, especially by modern standards, and especially because nanotechnology is coming to make us all functionally immortal (I’M NOT DYING, SHUT UP). But I still thought the episode built nicely to a place of genuine existential despair and then sort of… shoved it right back down so we could have the standard group hug. (I did like Hickey undercutting all of this by saying he had to go visit a former partner who had been in a coma since 1989.) It’s not a huge flaw—Community has been walking right up to the edge of the howling void and then walking right back with a hug since 2009—but it’s one that nonetheless kept me from completely embracing everything that was going on in the end. Still, this is a very enjoyable, very funny episode of Community that ultimately has some interesting things to say about getting older and about the crippling haze that nostalgia can spread over our lives. I suspect when I think of it later on, I will think of it primarily in terms of its great gags, but I’m also pleased that the episode ended up being a lot more than just a G.I. Joe parody. The show is always at its best when it examines these characters’ emotional journeys and inner lives through the lens of pop culture parody and goofy gags, and “G.I. Jeff” is a terrific example of the form. It makes me excited for whatever comes next, even if I have less to say about it than usual. By far the best gag here is Duncan standing in for an evil henchman whose power is that any pain inflicted on him is felt by his identical twin brother. The cutaway to said brother—a waiter—is just fantastic. From my limited experience with the G.I. Joe cartoon, those sounded like many of the original voices. I don’t know if they were (because the credits are too hard to read on my Slingbox), but I hope so. Of the other failed henchmen, I think I best liked Sleep Apnea after Shark Arms. That’s a hero I can get behind. Danny Pudi is good fun as Fourth Wall, but I think the even better performance as Fourth Wall comes from the little kid playing with the action figure in the toy commercial. “We are in a toy commercial!” becomes that much funnier when said by a little boy. I get that the show often makes a joke of how rarely it gives Shirley material, and I get that the joke about her character in the animated reality being “Three Kids” is that so many supporting players in kids’ shows are reduced to one catchphrase or relevant bit of information. But c’mon! Give Shirley more to do! Did anybody else sort of half hope that the episode would include a vocal cameo from Chevy Chase? Nobody? I sort of thought that might happen.